In computer architecture, multithreading is the ability of a central processing unit (CPU) or a single core in a multi-core processor to execute multiple processes or threads concurrently, appropriately supported by the operating system. This approach differs from multiprocessing, as with multithreading the processes and threads have to share the resources of a single or multiple cores: the computing units, the CPU caches, and the translation lookaside buffer (TLB). Where multiprocessing systems include multiple complete processing units, multithreading aims to increase utilization of a single core by using thread-level as well as instruction-level parallelism. As the two techniques are complementary, they are sometimes combined in systems with multiple multithreading CPUs and in CPUs with multiple multithreading cores. The multithreading paradigm has become more popular as efforts to further exploit instruction-level parallelism have stalled since the late 1990s. This allowed the concept of throughput computing to re-emerge from the more specialized field of transaction processing; even though it is very difficult to further speed up a single thread or single program, most computer systems are actually multitasking among multiple threads or programs. Thus, techniques that improve the throughput of all tasks result in overall performance gains. If a thread gets a lot of cache misses, the other threads can continue taking advantage of the unused computing resources, which may lead to faster overall execution as these resources would have been idle if only a single thread were executed. Also, if a thread cannot use all the computing resources of the CPU (because instructions depend on each other's result), running another thread may prevent those resources from becoming idle. Overall efficiency varies; Intel claims up to 30% improvement with its HyperThreading technology, while a synthetic program just performing a loop of non-optimized dependent floating-point operations actually gains a 100% speed improvement when run in parallel. On the other hand, hand-tuned assembly language programs using MMX or Altivec extensions and performing data pre-fetches (as a good video encoder might) do not suffer from cache misses or idle computing resources. Such programs therefore do not benefit from hardware multithreading and can indeed see degraded performance due to contention for shared resources. From the software standpoint, hardware support for multithreading is more visible to software, requiring more changes to both application programs and operating systems than multiprocessing. Hardware techniques used to support multithreading often parallel the software techniques used for computer multitasking of computer programs. Thread scheduling is also a major problem in multithreading. Implementations include DEC (later Compaq) EV8 (not completed), Intel Hyper-Threading, IBM POWER5, Sun Microsystems UltraSPARC T2, MIPS MT, and CRAY XMT. A major area of research is the thread scheduler that must quickly choose among the list of ready-to-run threads to execute next as well as maintain the ready-to-run and stalled thread lists. An important subtopic is the different thread priority schemes that can be used by the scheduler. 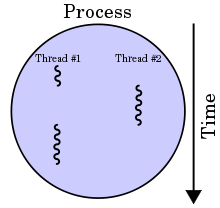 The thread scheduler might be implemented totally in software, totally in hardware, or as a hardware/software combination.